Don't miss Crowne Plaza's ONE PESO FLASH SALE happening on October 12, 2017! 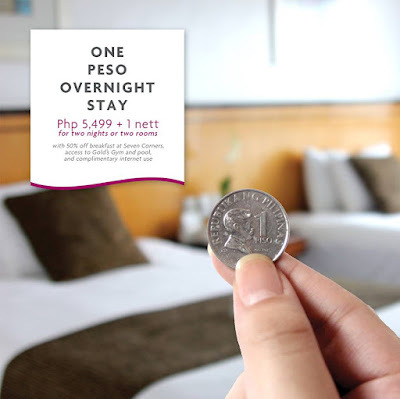 Get a cozy and relaxing guestroom stay for just P1.00 nett when you book your first night at Crowne Plaza Manila Galleria. For only P5,499 nett, enjoy a great staycation inclusive of complimentary internet use, access to Gold’s Gym and the outdoor pool, and a 50% discount on buffet breakfast for two (2) at Seven Corners Restaurant. Then get your next night at P1 net! Booking period is October 12, 2017 only, for stays from October 29, 2017 to January 31, 2018. * Promotional offer is a total of P5,500 for two nights or two rooms.